Here, a previously built model is learnt for variations of shape and texture. These models are usually constructed by maximizing covariance (finding principal components) of either shape and texture. I particularly like working with the Basel face model, as full correspondences are also available for all of the vertexes in cylindrical coordinates. For many shape analysis problems (not necessarily face analysis), I believe that coupled variations provide a more suitable way for understanding the nature of data and the hidden language of the variables involved in the studied phenomena. The most recent research involves predicting full 3D shape from 2D occluding contours. This was one of the PhD contribution of Dr. Dalila Sánchez-Escobedo. Dalila Sánchez-Escobedo and Mario Castelán. 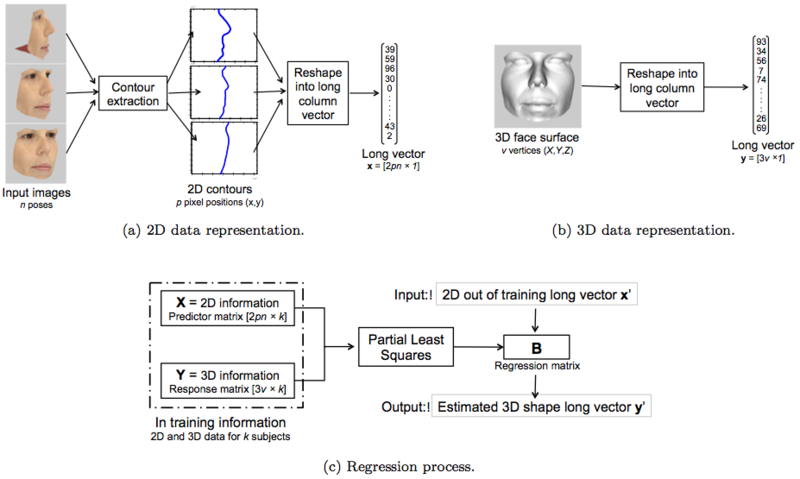 3D face shape prediction from a frontal image using cylindrical coordinates and partial least squares, Pattern Recognition Letters, 34(4): 389-399 (2013). Mario Castelán and Johan Van Horebeek. Relating intensities with three-dimensional facial shape using partial least squares, IET Computer Vision, 3(2):60-73 (2009). Mario Castelán, William A. P. Smith and Edwin R. Hancock. A coupled statistical model for face shape recovery from brightness images, IEEE Transactions on Image Processing, 16(4): 1139-1151 (2007).